I thought that CTV made a huge mistake when it released images from the season 4 finale that revealed that Charlie would be alright following his surgery. But really, Charlie’s fate was not the cliffhanger of the season. More on that later. After hooking up in the last episode, Cassie meets Jeremy’s ex during a healthy heart fair in the lobby of Hope Zion. Natasha senses that Cassie is sleeping with Jeremy and calls him on it when she sneaks into his bowel resection surgery with Dev. Despite leaving him, Natasha says she made a mistake, that she still loves him and will fight to get him back. After the surgery, Dev tells Jeremy not to hurt Cassie as he knows guys like him. Jeremy responds to Dev that he doesn’t know anything about his situation. So what happens to Cassie and Jeremy? Since Peter Mooney isn’t listed as a season 5 cast member, you can probably guess not good news. More on that towards the end of this recap. When Maggie kissed Zach and Dawn saw it, I assumed that the show was going to start another love triangle but I am glad that wasn’t the case. But at the beginning of the episode, Dawn and Zach are not together and Zach has no clue what he has done wrong after she rejected his gift of a teddy bear. Zach tells Dawn that he is probably going to move to Vancouver as his ex wants to move there with his sons. Zach is heading to Vancouver for the weekend for private school interviews and he has lined up a job interview at a local hospital. Dawn and Maggie treat a teen singer/songwriter/YouTube sensation DeShawn, who has come to Toronto for a songwriter showcase from Halifax. DeShawn’s mother has no clue he is in TO or the Six as Drake calls Toronto. DeShawn has breathing difficulties and Dawn determines that he has a hole in his heart that requires surgery. DeShawn was hoping he could still go to the showcase but alas Dawn says fixing his heart is more important. Maggie wonders if they can give DeShawn some medication instead so he can still make the showcase. Dawn coldly rejects that idea. The operation to fix DeShawn heart is a success and he tells Dawn the reason why his mom is against his singing. His dad was a trumpet player and died of an overdose and she fears the same fate for DeShawn. DeShawn seeks some advice on how to tell his mom and Dawn suggests using music to do so. DeShawn starts to sing about a secret heart and this gets Dawn to realize that she shouldn’t be afraid to let her guard down and be vulnerable. Later, we see DeShawn performs the song for his adoring fans in his room when his mom arrives to hear her talented son and seems to accept his choice to become a musician. As Dawn leaves DeShawn’s room, Maggie approaches her to see what she might have done wrong as she sensed a negative vibe between them. Dawn admits she was seeing Zach and she saw them kissing. Maggie admits that she did kiss Zach and that he told her about Dawn. Dawn seemed surprised at that and that Zach rejected Maggie. Maggie promises there is nothing between her and Zach except for friendship. Dawn then rushes down to the ER in hopes to find Zach only to be told by Jackson that he left for Vancouver already. Dawn finds the teddy bear Zach was going to give her and returns to her office to find Zach there. Dawn apologizes for being an idiot, to which Zach agrees. Dawn then tells Zach that Maggie told her about their kiss. Zach says it meant nothing and Dawn knows that. Dawn wants Zach to stay at Hope Zion and that she will travel back and forth as many times to Vancouver so Zach can be with his sons. The two then share a sweet kiss and are back together. Man, I really love those two crazy kids together. Charlie is in his tux looking at Shahir performing his surgery while spouting factoids about Beethoven. Charlie is narrating his thoughts as the surgery is on going and talks about the sense of Deja Vu. We then see Alex give a successful fellowship pitch. Alex knows that everyone at Hope Zion about Charlie when Dawn pulled her aside to asking her something but really it was just concern over Charlie. Alex is in the hospital chapel and Charlie is there. His voice over tells us that he will make it back to Alex. During the surgery, Shahir notices that the tumor is more aggressive than first thought and it is malignant. Shahir tells Alex of the cancerous tumor and there are two choices. Stop the surgery, use radiation to reduce the tumor and Charlie will only have a year to live. Or perform the surgery to remove the tumor but the way it it could result in Charlie dying on the operating table. Shahir gives Alex 20 minutes to decide. Alex is doing research to see what people did on similar cases but can’t find anything. Alex then asks Jeremy what Charlie would do as normally he would be the person she would go to for advice. Jeremy suggests that Alex talk to Charlie. So back in the chapel, Alex asks Charlie what she should do. Charlie tells her he wants to grow old with her and to fight for him. Alex asks for a sign and a petal from a flower fell. Alex is 10 minutes later from Shahir’s deadline and tells him to take the tumor out. Throughout, Charlie is going through the halls of Hope Zion talking about all the spirits he has helped and doesn’t want to find out what is on the other side just yet. We also see glimpses of Charlie at the beach and always talking about the feeling of warmth. Shahir lets Alex in the surgery despite his better judgement. Alex knows things are good because she can still feel Charlie’s presence. Shahir removes the tumor but his brain starts to bleed and Alex acts as second hands to stop the bleeding. Charlie senses something is wrong with his surgery and tries to get back to the OR to see what is going on but finds himself running in circles around Hope Zion. Charlie ends up in the morgue and sees the ME about to perform an autopsy on him and he tells that he isn’t dead yet. Charlie is now in the OR and sees that Shahir and Alex stopped the bleeding but he disappears while we see his spirit going into the ocean as talks about feeling cold. Alex can no longer feel Charlie’s presence and thinks something is wrong and begs Shahir to double check but he instead kicks her out of his OR. Dana arrives to offer some comfort to Alex. Dana seems to be in remission from her cancer and is itching to get back to Earth. Dana gives some word of encourage to Alex but then we hear a cold blue in Charlie’s ICU room. Alex rushes in and starts performing CPR on him and Shahir comes with the paddles top shock his heart. At first it doesn’t look good to Alex goes into an empty room and prays to God for Him to make sure Charlie is okay. Alex believes she is cursed and vows to stay away from him, if God make sure he is okay. A nurse comes in to tell Alex that Charlie has gotten a pulse. After 3 months of rehab, Charlie is doing fine and his ghost free. Charlie and Alex are getting ready to go to the fellowship awards dinner. Alex is a bundle of nerves but our favourite couple are doing a okay. Meanwhile, at Hope Zion, we see that Tom Crenshaw has returned, whether he escaped from prison or got released, we will find out next season. Crenshaw is asking of Charlie or Alex is on shift. A nurse tells him but they are probably at the fellowship awards dinner along with half of the hospital. I was thinkin the nurse really shouldn’t be telling him that information at all. As Crenshaw was making his way to the nurses station, we see that Crenshaw clearly remembers his time in the spirit world and Charlie no loner helping him. At the Royal York, we learn the awards dinner is being held on Valentine’s Day (the day this episode aired). And the doctor’s cheering over their single status. Maggie doesn’t want to get too drunk to make her acceptance speech and we learn that she and Alex combined their pitches and won the fellowship. Dawn and Zach have just flown in from Vancouver just in time for the dinner. Alex notices Dawn wearing sneakers and that is because Zach’s son, Jacob, threw up on her Minolo’s as he was excited to see them off. So glad that these two are still going very strong and after her shoes have dried off, takes her for a spin on the dance floor. As for Cassie and Jeremy, well he got back together with Natasha as he didn’t realize how much he still loved her. We learn that Jeremy and Natasha are moving back to LA in the morning and he apologizes to Cassie for what happened. Cassie doesn’t really want to hear it and leaves the dinner. Dawn introduces Dana who gives a nice speech about Maggie and Alex. Throughout the speech, we see Crenshaw arrive and watching the speech. When Alex and Maggie go up to make their speech, Charlie gives Alex a hug but then he sees a spirit telling he shouldn’t be here. Charlie turns around and see Crenshaw pointing a gun at him saying he broke his promise and he is now going to pay and we see him pull the trigger. And this is the end of season 4!!! Not quite as explosive as last season with Joel being blown to pits but we won’t know the fate of our Hope Zion doctors until next season. Who got shot? Charlie? Alex? Maggie? The whole ballroom? I really don’t know how much tragedy can one take. BTW, when Crenshaw asked about the whereabouts of Charlie, he then asked about his ‘wife’, did Charlie and Alex get married? when? I hope next season they focus more on the spirits and the stories they bring, not the dark spirits like ‘Ghost Whisper’ stupid stories. Thanks for your kind words. I think it was an assumption on his part. I noticed that too but I think he just assumed. Plus, I didn’t see any rings and I would think the show would have made a big deal of them getting married. Do you know if DeShawn is a musician? I’ve searched everywhere for the song he sang on the show and can only find Ron Secmith. Thanks! Did we ever find out who is the father of Baby Luke? I watch this in the US and we are just ending season 2 but can’t stand not knowing more. I can’t find it anywhere. In the season 4 premiere, there was talk on doing a paternity test on Luke. In the end, Alex and Charlie decided not to. Throughout season 4, Charlie refers himself as Luke’s father and stats to others that he has a son. So I think the show isn’t going to address Luke’s paternity going forward. Who sings the latest commercial promo? We’re running out of hope tonight? Something like that. Thanks! You’re welcome. Thanks for reading and glad you liked it. Is sydney still coming back? I don’t think so but she may come back for guest appearances. I think Maggie’s arc will be interesting to watch in season 5. When they will start showing season 5? And did you know what season and episode that maggie and gevin start developing their feelings to each other? I believe it was season 1 and the second to last episode “Ride Hard or Go Home” if I remember correctly. 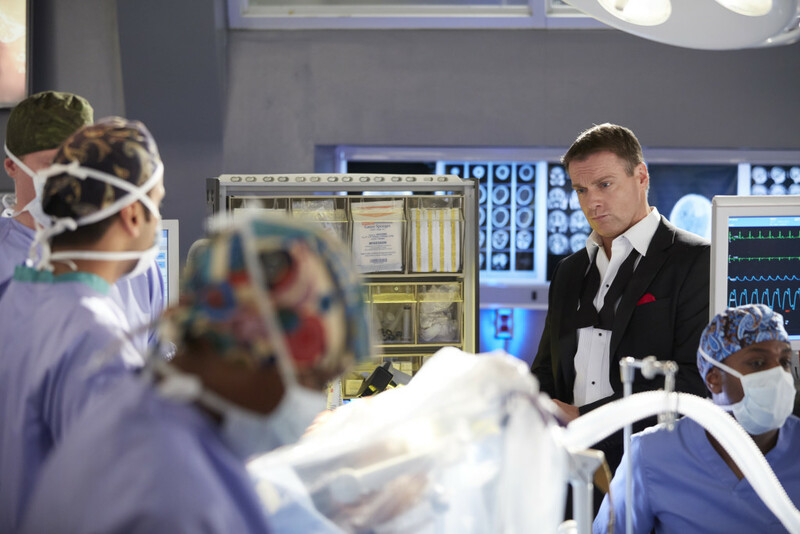 Saving Hope is entering its fifth season in Canada on CTV. Right now four seasons have aired in Canada with the fifth starting in the Fall on Sundays. If you read my recaps, it will answer your questions about Luke’s paternity and how Joel’s death has affected the staff of Hope Zion. Who the hell is Crenshaw ? From what episode he was in the story ? Crenshaw appeared earlier in season 4. He was the prisoner that was brought into Hope Zion and asked Charlie to help clear his name. Charlie was about to clear Crenshaw in the death of his wife but then realized he really did kill her and told his spirit that he won’t help him. Usually spirits don’t remember their time in that world but not so in Crenshaw’s case. The producers need to finish ‘Saving Hope’ properly. That’s not how a movie should end, especially one like this… As Venessa said, who really got shot?? I mean, C’mon Charlie can’t just die and I won’t assume that he just died either, especially in a room filled with innovative doctors and nurses. Can’t there be a season 5??? There is a season 5 of Saving Hope. It will air in the Fall here in Canada. Read my recaps to find out what happens. I love the Season Hope, program and how it has progressed. Yes, it has it’s twists and turns, but that is to be expected. The “reality of the surgeries and information, keeps me looking”, The romance obviously always needed, in this world. Who is the ‘old lady’ spirit at end of episode warning Charlie? Is she from his past? Relative? What???? i just finished the finale for season 4 here in the U.S. on ION…i see that we are behind in the episodes from Canada..Someone said that season 5 will air in Canada around now..in the fall…does anyone know when it will air here in the U.S?? I love this show. I hope the U.S. will get to see Season 5!!! 2 hour special on Valentines day. Hope its beginning of season 5. Thats here in us,love this. My mother does as well as my 7 yr old daughter. Hope it picks back up after 5. Omg…. Seriously how much can one couple go through… Charlie and Alex are soulmate’s, any woman would want a relationship like that. They are the biggest reason I watch Saving Hope. I love this show so much can’t everyone live, and Maggie finally find love too she really deserves it. I pray they are all OK, and back on the show for season 5… I’m so addicted…. Just saw season 5, first episode. Alex gave Charlie back his ring because she feels she is cursed and is the cause of all of Charlie’s brushes with death and injuries. Portraying surgeons, we assume that they are intelligent people, and to have to watch them play the cat and mouse game would be monotonous, since we watched this for 3 3/4 seasons. I would prefer to see them work this out and have Hope help Charlie find the reason why he see’s dead people. After all, that is the draw of the show. And Charlie’s gift can be a good thing, especially since he may not be able to operate soon or ever again. There are more character’s that we live, and maybe they could be developed more. I would hate to see Saving Hope turn into a soap opera. Currently it is not sappy, not involving cheating, lying or bad deeds. I hope it remains that way. It is a great problem. Sorry, I meant Alex help Charlie, not Hope. I hope that Charlie is Luke Father. Regardless, Charlie will always be there for him. When this show concludes I hope Charlie and Alex are husband and wife. They truly love each other and has had so many obstacles in their path. They are not cursed and Charlie ability to see spirits is a gift. He saves so many and the ones he can’t are at peace after interacting with him. Please give Charlie, Alex and Luke the “Happy Ending” they deserve.